[ Paul & Dominic Colnaghi & Co., London printsellers. ] Itemised manuscript invoice to 'John Edward Taylor Esq', signed by 'J. W. Wood', including commission on 42 lots purchased for him at the 'Percy Sale'. Paul & Dominic Colnaghi & Company, 14 Pall Mall East, 'S.W. next the College of Physicians', London. On the firm's engraved billhead. 'Midsr. [i.e. Midsummer] 1890'. Taylor's collecting activities are described in his entry in the Oxford DNB. His collection was sold by his widow in 1912 for the massive sum of £358,500.3pp., folio. Bifolium. In very good condition, on lightly-aged paper. Tastefully-printed billhead, as one might expect, in black and red, with royal crests, boasting that the firm are 'Printsellers by Appointment to her Majesty, | Their Royal Highnesses The Prince Consort, The Prince of Wales, and the Duchess of Kent'. Also the text: 'Established 1760. | Half price allowed for packing cases if returned immediately'. 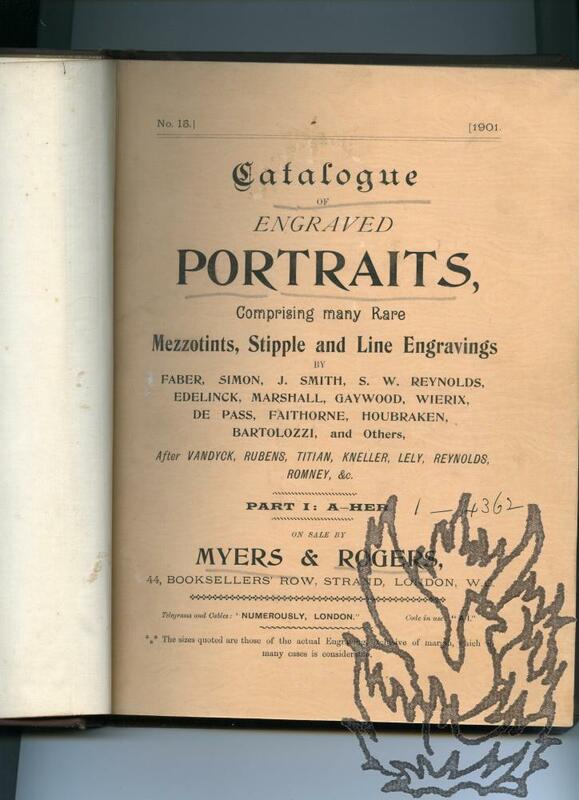 [ Moon, Boys, and Graves, Printsellers to His Majesty, And Publishers of Works of Art. No. 6, Pall-Mall. ] London: Printed by J. Moyes, Took's Court, Chancery Lane. 1829. 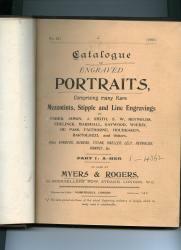 Full title: 'A Catalogue of Engravings, by the most esteemed Artists, after The finest Pictures and Drawings of the Schools of Europe; Systematically arranged under the painters, and by Index to the Subjects: Accompanied by a List of Works in Progress, or recently completed: And also of various Books of Prints, Forming part of the stock of Moon, Boys, and Graves, Printsellers to His Majesty, And Publishers of Works of Art. No. 6, Pall-Mall.' viii + 214pp., 8vo. In original quarter-binding of grey printed boards and black leather spine. Two Aquatint engravings by William Henry Pyne, both engraved by 'Smart & Hunt', titled 'Cheap Meat', showing an angry man bursting into an eighteenth-century bookshop, and 'A Thief in the Kirk', showing a man in tartan running through a congregation. Both in the same style. ONE: 'Cheap Meat.' Dimensions: paper 25 x 29.5 cm; plate 22.5 x 27.5 cm; image 18.5 x 23.5 cm. In good condition, lightly aged and worn, with slight discoloration to corners from previous mounting. Beneath plate: 'W. H. Pyne delt. [John Hassell, artist and engraver.] Autograph Note Signed ('J Hassell'), arranging to offer 'something interesting' to an unnamed employee of the London printseller 'Mr Boydell' [either John Boydell or his nephew Josiah Boydell]. 'Thursday Morng [no date] | 11 Clements Inn'. 1p., landscape 12mo. In fair condition, on aged and lightly-stained paper. The note reads: 'Dr Sir, | I shall do myself the pleasure of waiting upon you the beginning of the week, when I hope to have something interesting to shew you for Mr Boydell - believe me | Dr Sir | Yrs truly | J Hassell'. Catalogue des Gravures sur Acier publiées par Furne, Jouvet & Cie, éditeurs. 1882. Paris: 45, Rue Saint-André-des-Arts, 45. 8vo: 32 pages. Stitched pamphlet. In small type. Good on aged paper with light wear to covers and dog-eared corners. Text clear and complete. A few pencil notes. Prices are given. The last four pages consist of an 'Extrait du Catalogue de Librairie Furne, Jouvet et Cie, éditeurs'. No illustrations. Scarce: not in the Bibliothèque Nationale, which does however contain a copy of an 1871 catalogue by the firm. No copy on COPAC. The British Library has one of the firm's catalogues from 1890. Parts I to III (numbered 15 to 17) published in 1901; Part IV (no. 18, supplement) published in 1902. Parts I and II 'On Sale by Myers & Rogers, 44, Booksellers' Row, Strand, London, W.C.' Parts III and IV by the same firm from 59 High Holborn. 8vo: continuously pagined 1-187, followed by three pages of publishers' advertisements. A tight copy, in good condition, with the four parts (each of which retains its original orange printed wraps) bound together in contemporary brown cloth gilt and floral endpapers. An invaluable reference work, containing a total of 14293 items, each priced and with a brief description. Example: '4428 Hobart (Mrs.) Lady Buckinghamshire, caricature by Newton, Mrs. H. (very corpulent) driving over the weighing machine in front of a Weigh House, sinks down in the pit, folio, 1797, 4s'. Autograph Letter to Paul Colnaghi. Heythorpe | March 14th 1820'. English author and politician (1797-1833), whose efforts resulted in the formation of the National Gallery. Colnaghi (1751-1833) was the leading printseller of the period. One page, quarto. Good, on slightly discoloured paper with traces of previous mount adhering to reverse. A formal letter in the third person. 'Mr Agar Ellis would be much obliged to Mr Colnaghi if he would procure for him the German prints in outline for "Ondine", published at Nuremberg - Also the Prints in the same style for the German play of "Faust".